A childhood illness forever shapes the life of a Sinai Hospital doctor. Dr. Jonathan Ringo keeps the kind of schedule that would leave men half his age utterly exhausted. 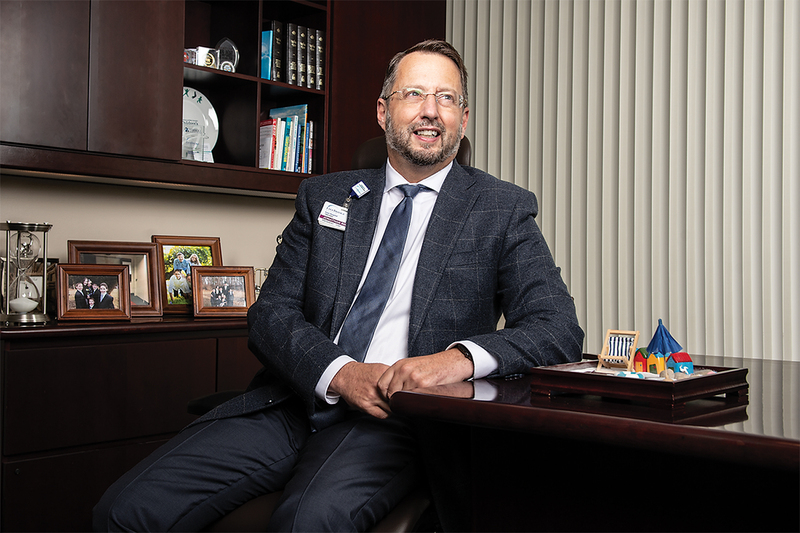 After morning prayer at the Jewish seminary on the Pikesville campus on which he lives, Ringo, 49, makes the short commute to Sinai Hospital of Baltimore, where he serves as president and chief operating officer. At work, he deals with everything from construction issues to contract negotiations to overseeing a staff of 4,800 employees. As a practicing obstetrician-gynecologist, once a month or so, he delivers a baby. He takes time to pray in the middle of the day and, in the evening, often eats dinner with a board member or another physician to talk shop. He answers emails and takes phone calls while walking on his new treadmill desk at work (at the pace of two to three miles an hour), devotes as much time as he can to his brood of six, helps with their homework, swims a half mile three times a week, and manages to study the Talmud before going to bed past midnight. Relying on a steady stream of caffeine and strict self-discipline, Ringo says that sleep is about the only thing he doesn’t fit into his schedule. By his count, he takes roughly 15,000 steps a day. “You don’t want to miss an opportunity,” is how he sums up his credo. It wouldn’t take an attending psychiatrist at Sinai to read between the lines of Ringo’s life. Forty-three years ago, the good doctor almost died—and the fact that he didn’t provided the leitmotif to his life. Sitting in his homey office on the first floor of the 152-year-old hospital—one of the first to treat and train Jewish people—Ringo, an Orthodox Jew, recounts how he came here by way of his native South Africa, first arriving in the U.S. in 1975 as a 6-year-old patient at the Dana-Farber Cancer Institute in Boston. Stunned by the news, Ringo’s parents drove him to the children’s hospital in Johannesburg for further evaluation and a bone aspiration to determine the exact type of blood cancer. With lab results complete, the news went from bad to worse: It was a fairly rare type of blood cancer known as acute myelogenous leukemia, AML in medical shorthand, a cancer of the myeloid line of blood cells characterized by the rapid growth of abnormal cells that build up in the bone marrow and blood and interfere with normal blood cells. At the time, the cure rate was no better than 10 percent. “My parents were told, ‘There’s nothing we can do—just take him home and keep him comfortable,’” Ringo recalls. With lab results complete, the news went from bad to worse. . . . At the time, the cure rate was no better than 10 percent. At times, the side effects made Ringo as sick as the disease itself. He lost his hair—and his appetite. He developed mouth ulcers. He required so many infusions that doctors used the veins in his legs for procedures. “My mother was there by my side the whole time,” he says, “and she was like, ‘We’re going to get through the next five minutes, the next hour, the next day.’” Within three to four months, he was in remission. 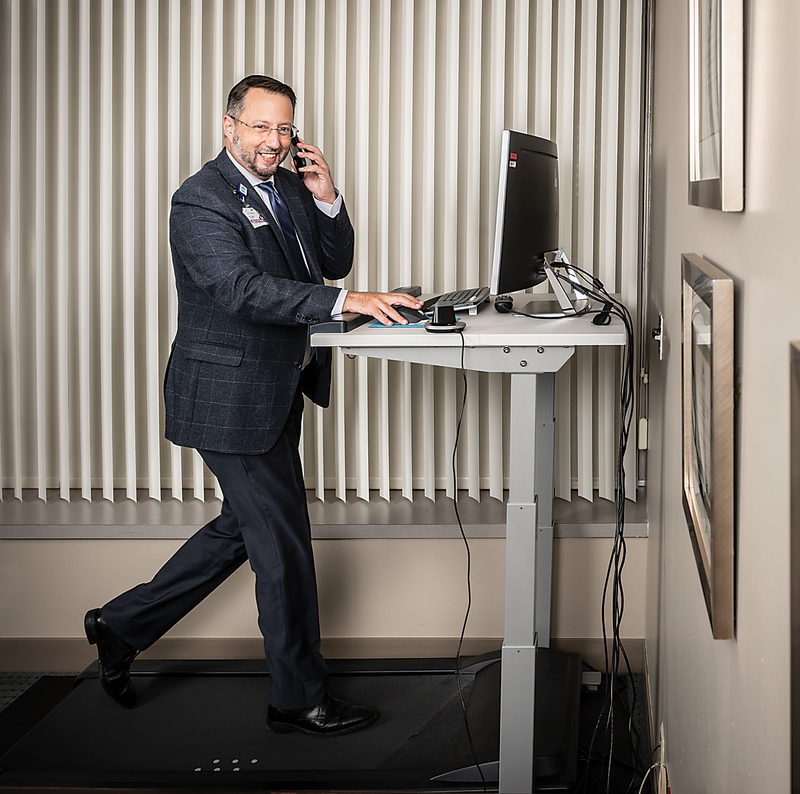 Dr. Jonathan Ringo often works while walking on his treadmill to get the most out of every day. Even decades later, Ringo can cite chapter and verse the names of the drugs he was infused with, the names of the doctors who treated him, the months and years that he went into remission, and the practical jokes that he played with his family to add some levity to his life. Before pursuing medicine, Ringo worked in the biotech field for six years. By 1998, he found himself in Baltimore because he had a sister living here and was dating the daughter of a Baltimore rabbi. (He later married her.) By 2004, he was pursuing his dream and enrolled in medical school in St. Kitts and Nevis at the International University of Health Sciences. After medical school, he ended up back in Baltimore, eventually specializing in obstetrics and gynecology because of the broadness of the field. “You have pregnant women with diabetes and, all of a sudden, you’re dealing with two patients, not just one,” says Ringo. on a late July day, wearing a pinstriped suit, a velvet kippah, and a blue tie that matches his eyes, Ringo stops by the pediatric unit to accept a large donation from a family that lost their young son to cancer. Later, he makes the rounds with Director of Patient Experience Katie Starkey. Together, they visit various floors to check in on staff and patients. As he wanders through the infusion center, he stops to chat with a patient and introduces himself. “I’m meeting the big boss today,” she says, smiling. “Is there anything you need? How are you doing?” he asks. A few steps down the hallway, he stops in to see another patient. They speak about her relatives in South Africa, and he congratulates her on her clean PET scan. Ringo’s past is never far from his present. “My leukemia was a gift of life,” he says. “It was such a positive thing. It gives you a different appreciation of every day. In our hospital here, above the elevators, there’s a saying from the Talmud that says something to the effect of, ‘If you save one life, you save the whole world.’ I have that here with these photos of my six kids over my shoulder—that’s all a result of that.” And though his days are busy, taking time for thrice-daily prayer allows time for reflection.